A couple years ago when I took an Art history course, I fell in love with illuminated manuscripts. They are beautifully detailed works of art so searched online and found St John's Bible. 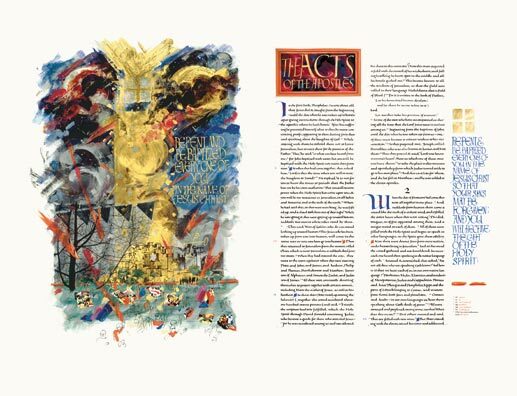 The St. Johns Abbey and University commissioned Donald Jackson to produce a hand written, hand illuminated bible. I bought one for my folks, because you know parents are the world's hardest people to buy gifts for, because they have everything. They loved it and I enjoyed sharing it with them. Which brings us to the 12th century or back to the 12 Century (1101-1200 AD) as it were. Back in the 12th century, during the middle ages, books were made by hand, one at a time with ink, pens, brushes and paint on vellum or parchment. Paper made of cotton and linen began to replace parchment in the 1200's but paper really didn't come into common use in Europe until the 1400's. The Christian church was the center of learning in Europe and medieval books were made by monks and nuns in the scriptorium. The Chinese invented movable clay type during the 1100's and the Europeans didn't have moveable type until the mid 1400's. When the demand for books increased, rulers set up workshops in palaces and put them under the direction of well-known scholars. I'll let you in on a secret. I'm not a huge fan of historical fiction. I'm very picky about my reads and they must be well written and the storyline intriguing enough to hold my attention. So when I decided to do the Centuries challenge, it surprised me to find had so many books from different eras on my shelves. Figured I'd pick the 12th Century to begin with, because if I managed to read at least one book a month from each century progressively, by the end of the year, I'd be in the present. However, once started perusing the shelves, and seeing all my choices, can guarantee my reading will be all over the map this year. Back to the task of reading books either written in the 12th century or set in the 12th century. When I did a search online, I found this goodreads list of the best books published in the 12th century. The list was kind of daunting, so decided I would go with books set in the 12th century. Surprisingly, I found I had a few on my shelves which we had inherited when my husband's mother passed away. She was originally from England, a writer working on an historical fiction novel and had quite a collection. For example, Sharon Kay Penman's When Christ and His Saint's Slept, (and her whole Welsh trilogy but that was set in the 1300's), and Sir Walter Scott's Ivanhoe. A couple years back I read Elizabeth Chadwick's The Scarlet Lion and fell in love with her writing and the storyline. I've since added Greatest Knight and A Place Beyond Courage to my library. Yes, I'll admit it, I'm a bookaholic, and a book hoarder, and I have more books than bookshelves. Which is one our projects this year, to build wall to wall bookshelves in our master bedroom, but I digress. Your mission, should you choose to accept it, is to read a book set in the 12th century. Finally got around to reading Holes after seeing the movie SO many times. I really liked Holes. As a matter of fact, I really like most things by Louis Sachar! If you haven't read it, you might look into Sideways Stories from Wayside School. I read At Play in the Fields of the Lord after having it recommended to me in an Anthropology class. I really enjoyed it and am looking forward to finding and watching the movie. So glad to hear you enjoyed it. I really want to read it now. Hope you find the movie! I decided to choose a different category. Sorry Robin, but on a good note I am still continuing with me reading challenge. The reason why I chose to read "The emperor of all melodies" this week is because I have off from my MBA program in pharmaceuticals. I highly suggest everyone to read this book. The author does an amazing job at explaining this book in simple terms. It is very insightful and will allow people to understand what cancer is all about. No apologies necessary. We are all allowed to change our mind when it comes to reading books. My Week #2 book was "Stoner" by John Williams. Review to follow later. It's neat that you should bring up the St. John's Bible! My college currently has a "Heritage Edition" (high-quality copy) on exhibition in our museum right now. I had to go to the official presentation as part of an Art History class. Did you know that the project was conceived by the British Queen's Royal calligrapher? And that many illustrations in the text depict Minnesotan prairie plants and animals because St. John's abbey is in Minnesota? This manuscript project has a ton of cool trivia! How cool! I would have loved to go to the exhibition. Thanks for sharing the additional info. I wasn't aware of it. I'm enjoying the challenge again this year after taking a break from it last year. Am doing the A to Z challenge as well, so read 2 books that began with A (weeks 1 and 2) and now read one that began with B (week 3). Thanks for hosting this fun link-up! Good way to do the A to Z. Happy you are diving back in. I got the name of my blog from a book. The dragon in said book was guarding a book of prayers that would fall under illuminated manuscripts. I saw some at the Getty once. Very cool but the photographs don't do them justice. How neat, thanks for sharing. Whoops! I'm falling behind. Book Two: The Power of Change by Charles Duhigg has the potential to be a life-changer.